Your Musical Theatre Resource for Southern California! When you're a kid you can fly. You fight pirates, dance with fairies and create a world completely out of your own imagination. 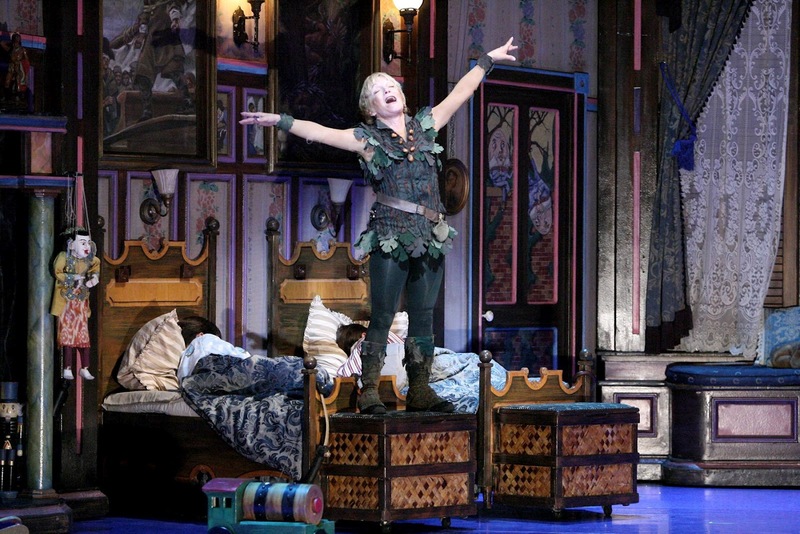 For most of us that ends as we reach adulthood, but when you're former world-class gymnast Cathy Rigby, you get to live out those childhood fantasies again and again as mischief-maker Peter Pan in the beloved family musical of the same name. La Mirada Theatre for the Performing Arts has launched a brand new tour of Peter Pan with the cherubic-faced actress once again donning her trademark Lost Boy grubbies and flying through the air with such speed and agility it will take your breath away. Children of all ages will wish they could reach for a handful of Rigby’s fairy dust and join her as she somersaults, spins, dances, and crows with reckless abandon. You’ll laugh out loud at the hilarious ways she tries to stick her shadow back on, cheer when she defeats the villainous Captain Hook, and blink back tears when she begs the audience to help her bring Tinkerbell back to life. So convincing is she as Peter Pan that you may find yourself shaking your head in wonder at how completely she transforms herself into the playful, little boy who won’t grow up. It is a performance to love. Whether you've seen it before or this is your first "live" Peter Pan, you owe it to yourself to go and see Rigby and the rest of the sensational cast bring Sir James Barrie’s classic story to life under Glenn Casale’s direction and Bruce Barnes’ musical direction. Kim Crosby, who was the original Cinderella in Into the Woods on Broadway, plays the lovely, warm-hearted Mrs. Darling and later, Wendy, all grown up. The aptly named Darling children are Cade Canon Ball and Julia Massey (yes, she's a girl) as John and Michael with a splendid Krista Buccellato returning to her role as Wendy. Broadway veteran Brent Barrett (Chicago, Annie Get Your Gun) is terrific in the dual roles of Mr. Darling and Captain Hook. The swashbuckling pirate with a devilish twinkle in his eye swaggers across the stage singing and pontificating in a lush baritone voice followed by his bumbling henchmen who can’t seem to do anything right. Their “Pirate March” is a very funny specialty number in which the men waltz, tango, and dance a tarantella while playing tambourines. No expense has been spared on the technical elements of the production which features luscious costumes by Shigeru Yaji, scenery filled with a multitude of surprises by John Iacovelli, and magical lighting by Michael Gilliam. The brilliant flying sequences Rigby performs are choreographed by “The Fly Guy” Paul Rubin. 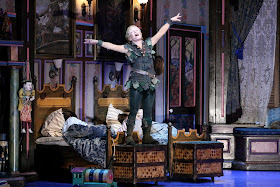 No matter how old you are or how long ago you left your childhood behind, when you see Cathy Rigby lift off the ground as Peter Pan part of your heart will go with her. La Mirada Theatre, 14900 La Mirada Blvd in La Mirada. For tickets and information: www.lamiradatheatre.com.